Rachel Von | The Journal Gazette Angola's Joel McCurdy tries to break away from West Noble's Braeden Hilbish during the second quarter at Angola on Friday. Angola's 21-7 victory over West Noble on Friday took on a greater significance, as many within the student section opted to wear teal instead of the traditional purple and gold school colors. Those special shirts, with the phrase “Liv It Up” printed on the front, were sold in honor of Hornet freshman Olivia Stoy, who is battling cancer in Indianapolis. Stoy's fight, now 21/2 years long, has garnered the attention of national media outlets. ABC World News Tonight previously chronicled her story, and the lake community in the heart of Steuben County has rallied to assist in myriad ways. Those efforts included a block party on the circle in downtown Angola in June, where local residents donated funds to help offset medical bills exceeding $350,000. An anonymous donor has also contributed a large sum of money, while local residents have purchased numerous “Liv It Up” T-shirts. In addition, Stoy designed a bracelet in conjunction with Emily Bryan, who runs an accessories business in Fort Wayne called Emily Kai. The “Lava Liv” bracelets contain lava stones, turquoise amazonite, bamboo coral stone, moonstones and a gold band that represents childhood cancer. 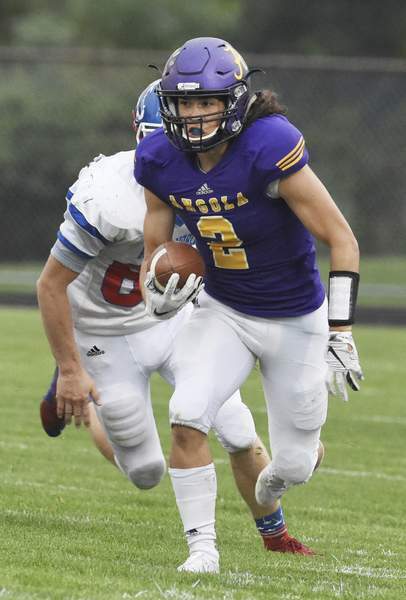 With Stoy writing a letter to the Angola student body, football team and community that the public address announcer read at halftime, the Hornets rode the emotional lift to shut out the Chargers in the second half. Northrop hasn't had a .500 season since it went 5-5 in 2006. Coming off five consecutive 2-8 seasons, coach Jason Doerffler's team looks like that curse might be over. He's preached all season to his squad to be different from recent Northrop teams. “We've been so close for so long and to finally turn the corner and get that win it's awesome; our kids deserve it,” Doerffler said. While the Bruins are only 2-2 right now and could squander the strong start to the season, in an SAC conference that keeps getting wilder every week, the Bruins are rising. After starting his head coaching career with two losses, including a 37-0 home loss to Mississinewa, New Haven coach Jimmy Linn may have been wondering what he'd gotten himself into. Two weeks into the NE8 season, Linn has gotten himself and the Bulldogs atop the conference standings. New Haven defeated DeKalb last week 28-21 and then rallied to beat Leo 24-21 on Friday, scoring the game-winning touchdown with 2:21 to play. Now the Bulldogs are tied with East Noble and Columbia City at 2-0 in conference play. “We're still in the driver's seat for the conference with the other undefeated teams,” Linn said. Many of Bishop Dwenger's students and fans were in the stands at Homestead on Friday night, but coach Jason Garrett said he knows not all of their most supportive alumni and supporters can attend each game in person. One such friend of the program, Chris “Gus” Gustafson, a member of the Indiana Army National Guard, contacted the team to let them know that he stays up to watch livestreams of their games when he is deployed overseas. Gustafson, who has coached grade school track at Saint Charles Borromeo, sent the team a flag that had flown over his base in Kuwait.